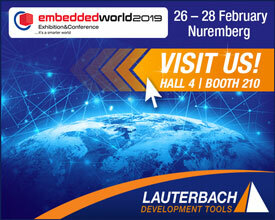 We warmly invite you to come and meet with our experts at embedded world 2019, taking place from 26th to 28th February 2019 in Nuremberg! Arm® 32-bit/64-bit Cortex®-A/-R/-M, Power Architecture®, Infineon TriCore™ Aurix™, Intel® Processors, Renesas RH850 and many further topics will be presented. Register HERE for your FREE TICKET with code B401890. We look forward to seeing you in Nuremberg!